The next morning they started letting people and by noon we were set up for the week. But by Thursday it had a few more people in the campground. The Marlboro exhibit offered the opportunity to ride with a professional driver in a new mustang on a small track. One lap around and then you drifted the next 3 laps. We were checking the place out trying to find out how to get a chance for a ride when a woman, De Anne Dwight, came up and asked if one of us (Max or I) wanted to be their guest for a ride. At first I thought she was kidding, but when I realized she wasn't, Max told me 'go for it'. De Anne Dwight, her husband Jeff, his father and me, before the ride. There are always the unusual. Here they rented a 28 ft u-haul to carry all the stuff out for their tail gate party. You can see the large BBQ grill and they had a large patio table (iron and glass) with chairs, 2 bars and enough firewood to have bonfires every evening. This was the Royal Ride car, a mix of look-a-like Rolls Royce front end merged with a VW Beetle to make the limo. And of course, there were the shopping cart races in the evenings. Max's son and grandson had a good run and won. And I even found a place to dance at the Camper Appreciation Night Event at the Speed Cantina. Max got to sit in his favorite driver's seat. Jimmie Johnson, you better watch out! 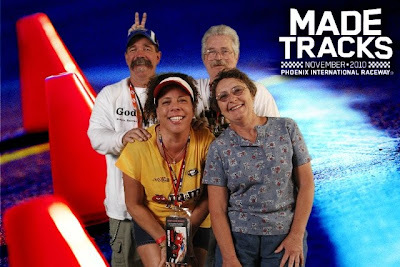 We went to the truck race which was held Friday night under the lights. But it was bright and sunny Sunday afternoon for the big race. And the stadium was full. And the winner was.....Carl Edwards, car 99. I have always wanted to visit the Grand Canyon, yet even in my 9 years of fulltime RVing, I never got to the Grand Canyon. The closest I got was in January 1991 on my way back from California on the way home to Denver. We had left Las Vegas earlier in the morning and it was 11 degrees. It was snowing when we arrived at the Grand Canyon. The kids didn't want to get out and do much because it was cold. You couldn't really see much because everything was covered with snow. We had some hot chocolate in the lodge and went on down the road. Well, finally, almost 20 years later I returned to the Grand Canyon and spent several days enjoying the wonderful views and doing some hiking. The El Tovar Hotel. Designed by Elizabeth Jane Coulter, employee of Fred Harvey Company, the hotel opened in 1905. Lookout Studio, built on the edge of the canyon. Looking down on Plateau Point which is 3000 feet below the rim of the canyon. Pictures don't do justice to the view of the canyon. There is no describing the awestruck beauty of this vast chasm in the earth. Zoomed in at 40X to get a glimpse of the bridge over the Colorado River in the bottom of the canyon, some 5000 feet below the south rim. Zoomed in again to Phantom Ranch, the only place to stay if you go to the bottom. There are cabins, dorm style bunks and a campground. Reservations and permits are required to stay overnight. They suggest getting reservations and permits a year in advance, but there are always people who cancel and if you are lucky or want to wait a few days you can usually get in. The Orphan Mine was established in 1893, but wasn't found profitable and mining was sporadic until uranium was found in the late 1950s. Until 1969 the mine was a major source of uranium during the cold war. The park service is now in a major clean up mode to decontaminate the area and make it once more accessible to the public. We stayed about 5 miles outside of the national park in Kaibab National Forest. A beautiful view of the canyon. Remember at the beginning I said I did some hiking? Well, Max and I hiked down to Plateau Point. Although only 3000 feet below the rim (just over 1/2 mile), it takes 6 miles to get there with all the switchbacks. And after climbing down, you had to climb back up those same 6 miles. I knew it would be a tough hike and it was, but I'm sure glad I did it. And yes, I was sore for several days after. It was a nice 8 hour hike. On our way out we stopped at the 3-mile rest area for brief moment. A look down at the switchbacks on the trail down to Plateau Point. Sunset at Mojave Point on Hermits Rest Route. I was glad to get back to Arizona in time to join my friends in Lake Havasu over Halloween weekend. Here are some of the things we did. Any time you get a group of WINs together you're likely to find us dancing somewhere. Here we are at the Eagles Lodge in Lake Havasu dancing the night away. But we also had the WIN Olympics. Here we are with the water balloon toss. Oops, I think the balloon burst. Next was the relay races in the pool. And here we had to use our nose to move the pumpkin across the pool. And Max is happy he was able to hold his breath the longest for that contest. And then everyone tried to outdo the other in making the biggest splash. One morning some of us learned how to play bocce ball. We saw this v-8 motor with a seat on top. Wouldn't that be fun to ride.! We shuttled some kayakers to the marina at the start of Topak Gorge. I've never seen anyone advertise they were the 'worst' at something. Some of the kayakers preparing to launch. The boat ramp doesn't look that bad to me. But the highlight of the rally was the Halloween Costume Party. Here is one of the most ingenious costumes, completely made from walmart bags. Claudia, what an imagination you have. Most interesting about Diane is she actually shoots black powder and made this costume herself. It's real leather. Needless to say, we all had fun in Lake Havasu for Halloween.